There are two types of mermaid stories here: One is neither myth nor folk tale but fiction written by a known author. The other type are the odd ball stories were the mermaid plays a small but important role. She may, for example, only appear at the very end or beginning of the story. Some of these links will take you to a different website where you can read the original version of the story. The link will open in a new page. I think that you would prefer this to my clumsy retelling and it will please the purists. Undine by Friedrich de la Motte Fouque, this was the basis for Andersen's tale, also, the basic legend has been used for operas, ballets, plays, poems, novels, etc. The Mermaid's Twin Sister by Lynn Joseph, who was born in Trinidad, gives us something new and different. Original author's version. The Golden Mermaid - This story is different in a couple of ways: the mermaid does not enter the story until near the end, she has legs and is very passive. Nothing like a long, slow, lingering death as in The Mermaid's Vengeance! Between this and The Little Mermaid you can see the large variety of stories that can be written about mermaids. The Undine legend by itself has a long and distinguished history in popular entertainment including manga and video games. Check out Wikipedia's Undine page for some examples. 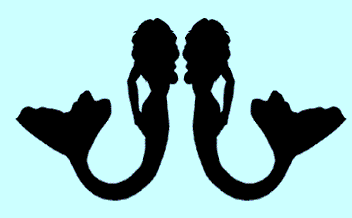 Check out Mermaid Mythology and the Legend of the Mermaid for more mermaid stories.